Imagination Technologies introduces its PowerVR GT7900, a new "super GPU" for affordable Android gaming consoles. 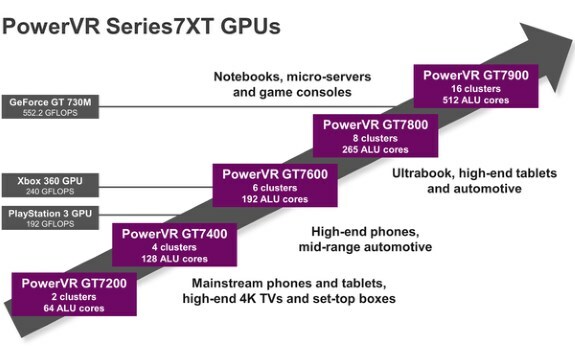 The firm says the PowerVR GT7900 is capable of 800 gigaFLOPS, this means that at least on paper it's capable of outperforming an old desktop flagship GPU like the GeForce 8800 GTX (518 gigaFLOPS). The GT7900 is designed to be made on a 14nm or 16nm FinFET process and is part of a bigger platform that features a quad-core, dual-thread I6400 MIPS CPU that supports Android 5.0. Full details at FUD Zilla. The goal is to bring PC performance and hardware support to Android devices, with OpenGL ES 3.1, new shaders, HDR texture compression and tessellation. Of course, the GPU supports UHD/4K resolutions.